In lesson 1 we discussed permanent deformation under a single repeated static point load. In roads however the moving traffic load causes a more complex dynamic loading phenomenon and this is normally considered as 3 effects: 1. The stresses in the pavement structure caused by the moving wheel load, 2. The time dependent response of the road materials and 3. The stresses induced by impact loads. 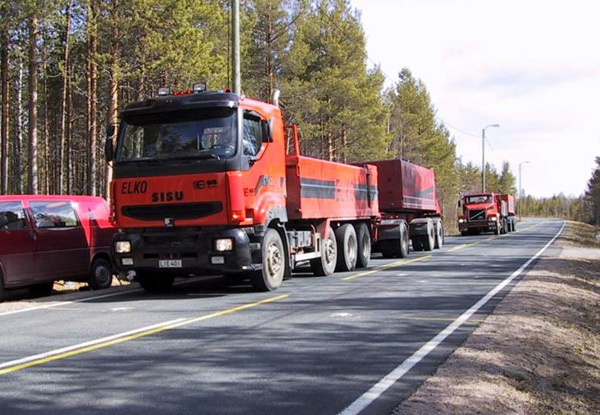 A single heavy truck passing over a weak road structure during the spring thaw weakening time in Finnish Lapland. 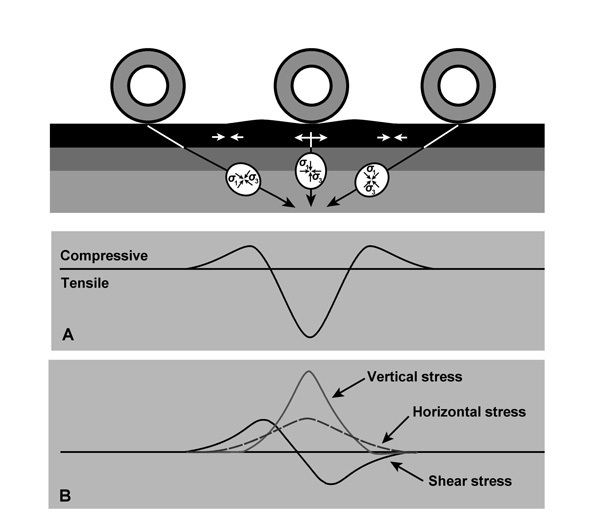 Figure describes the vertical stresses, horizontal stresses and shear stresses in the bottom of the bound layers as well as the compressive and tensile stresses in the unbound layers and subgrade soils. This shows that the principal stresses ?1 and ?3 rotate before, under and after the wheel load. 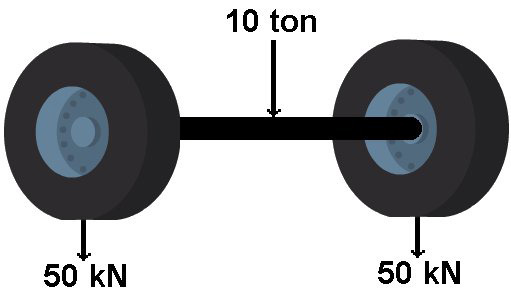 It is important to recognize there are compressive stresses in the bound layers in front of and behind the wheel load, while the stresses are strongly tensile under the wheel load. The time-dependent material response is another important parameter. This is especially important for those materials that are susceptible to permanent deformation and do not have a totally elastic response under a dynamic wheel load. These materials do not recover immediately after the load is removed and a truck with multiple axles may cause increasing strain to these types of materials. Finally the magnitude of stresses and strains is also affected by how smooth and even the road surface is. 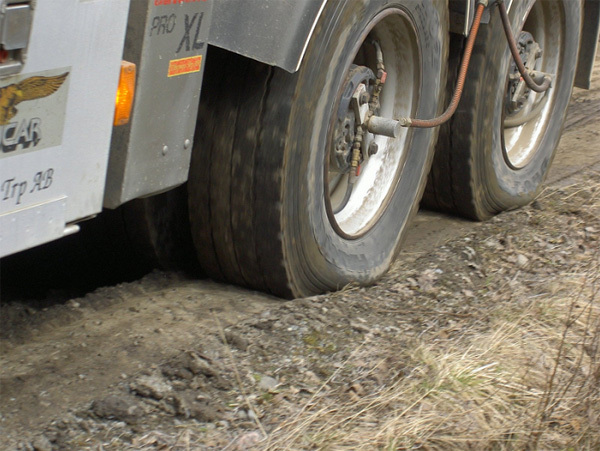 This is due to the fact that uneven bumps can cause impact loads to the pavement due to the suspension system of trucks. Because of this the stresses and strains after a bump can be substantially higher than the normal surface and cause a faster deterioration of the pavement due to water from the top of the wet base course pumping up through the pavement. This can be seen in thermal camera images taken in the Spring. 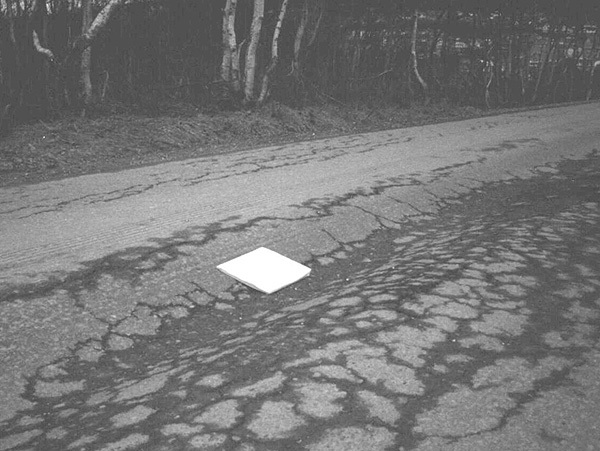 Road structures and materials in low volume roads in cold climate areas generally follow visco-elastic or visco-elastic-plastic behaviour rather than elastic behaviour. 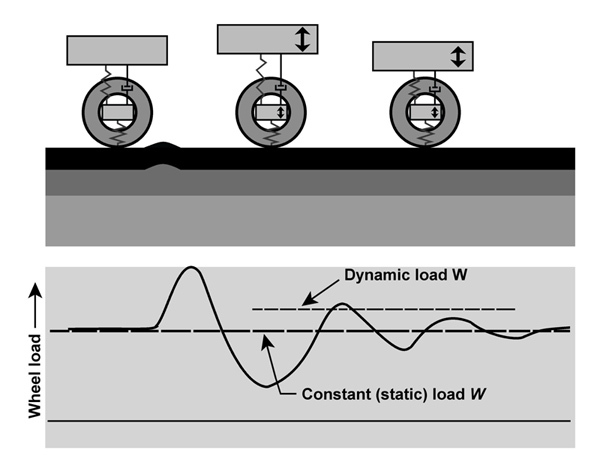 It is however important to understand the role of the elastic modulus in determining the bearing capacity and resistance to permanent deformation in the different parts of the road structure and subgrade soil. The overall structural quality of a road is defined by its “weakest link” and this can be located in anywhere the road structure, or in the subgrade. The elastic modulus, or modulus of elasticity, describes the stiffness of a material, i.e. its capacity to bear and spread load. In general, the greater the modulus the smaller will be the material?s elastic deformation (strain) caused by the stress increment applied. Depending on how the stresses and strains, and their directions are measured, many types of constitutive parameters can be used to describe the elastic behaviour of the material. These are: Young´s modulus, shear modulus, bulk modulus, Poisson´s ratio and P-wave modulus. More information on the different types of modulus possible can be read in Wikipedia and other sources. 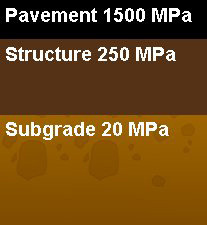 In an ideal road structure the modulus of the materials in the pavement layers should decrease from top to bottom. This is because the closer the material is to the surface, the greater will be the stress caused by the wheel load. A stiffer material will spread the load better over the layer below. This will reduce the stresses and strains in the lower layer and permit materials with a lower modulus to be used. The ratio between the moduli values of the two layers should not be too high however as horizontal tensile forces could be created in the base of the upper layer. The layer thickness and the modulus of a layer will affect the bearing capacity of the layers on top of it rather than the bearing capacity of the layers below. Thus the bearing capacity at the top of the pavement structure will be determined by the properties of the subgrade and each of the individual structural layers in the road. So when designing a road structure, it has to be ensured that the stresses and strains in every structural layer and on the subgrade are well below their critical limits. The same rule applies when designing the strengthening of an old road. There are many different ways to achieve bearing capacity when designing a new road or rehabilitating an existing road, but the long term resistance to permanent deformation must also be considered. This can be done by analysing those points in the road structure where the stresses and strains are close to the critical limit. 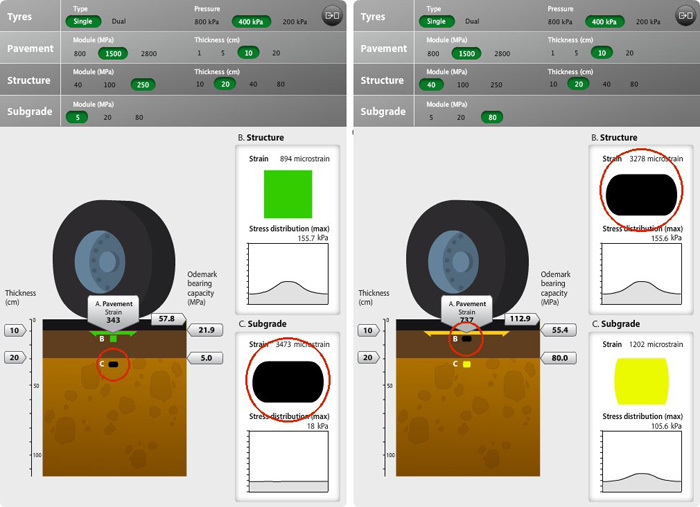 These critical points can be difficult to identify in a road structure and to help this ROADEX has designed a “ROADEX Pavement Stress and Strain Calculation Demo”. 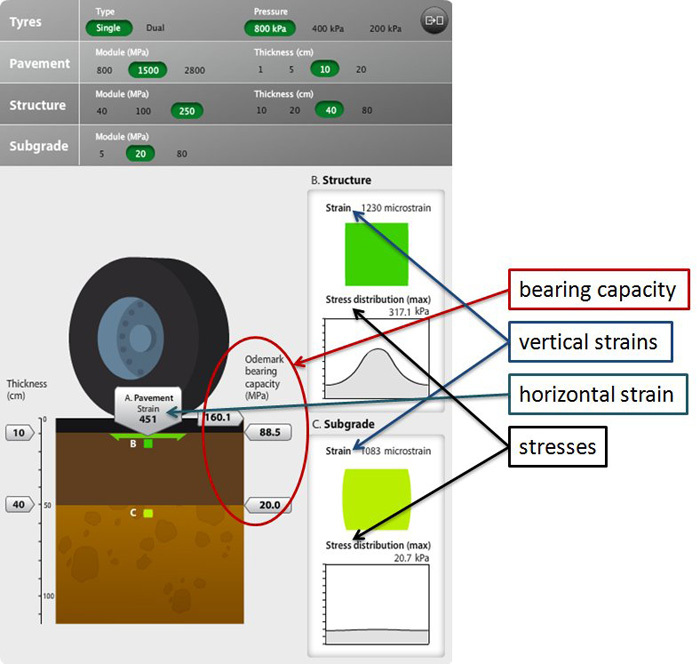 This will help the reader to estimate the stresses and strains in the road structural layers and the top of the subgrade as well as showing the development of bearing capacity up through the structure. In addition, the demo is designed to provide information on the effect of different tyre types and tyre pressures on the critical stresses and strains in the road. It is hoped that the ROADEX demo can be used as a simple design tool for low volume roads. It should be kept in mind however that there are other factors, such as road width, frost, drainage, etc. that can have a great effect on the bearing capacity and permanent deformation of a road and these should be considered also. The demo could also be used as a specialist tool to assess timber haulage routes; e.g. would it be more appropriate to use CTI on a route rather than strengthening the road. 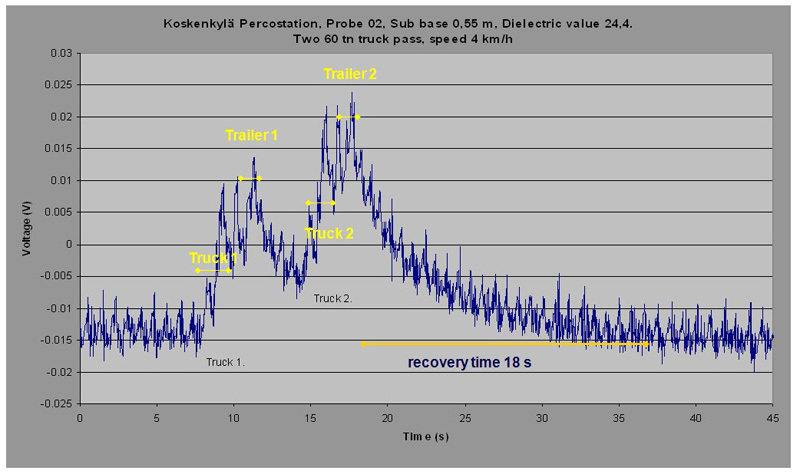 Note: “The ROADEX Pavement Stress and Strain Calculation Demo” has been produced for educational purposes only. The ROADEX project does not take any responsibility for its use in real design projects. The stresses and strains for the demo were pre-calculated using Bisar© software based on linear elastic theory. The calculations were carried out using typical loading configurations, layer thicknesses and material moduli found in the Northern Periphery. The parameters were chosen so that a wide range of road structures from very poor to very high quality could be covered. The wheel load used in the demo is always the same, ie a standard wheel load of 50 kN representing a 10 ton axle load. All of the other parameters can be changed. 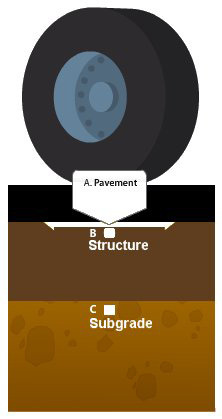 The road structure contains three layers: A. the pavement (the bound layers), B. the structure (the unbound structural layers) and C. the subgrade. To start, the loading configuration must first be selected and there are two optional tyre types and three tyre pressures to choose from. After that the modulus and thickness for the bound layers and unbound structural layers should be selected together with the modulus for the subgrade. These are considered to be the most critical in the road structure for permanent deformation to develop. High values in this position indicate the risk of pavement fatigue. The stresses and strains in this position are the most critical for the development of Mode 1 rutting. The stresses and strains in this position are the most critical for the development of Mode 2 rutting. Each strain is also given a colour that represents the risk of permanent deformation or failure in the layer. The weakest layer in the arrangement defines the overall rating of the whole road structure. For example, if one or more of the three strains is rated black then the whole road structure is considered to be inadequate and is likely to have failures under the designed loading. The vertical compressive stress distribution for the structure and subgrade is also shown in its calculated position. The value displayed is the maximum stress at the calculation point. The demo also displays the bearing capacity at the top of each structural layer as calculated using the Odemark method. Detailed instructions for use are presented here.